You are here: Home / Discovering God / Look up! On Tuesday night, my friend Parks set his camera up on a hillside and captured an image of the comet Pan-STARRS, below. On Wednesday, Thursday and Friday I attempted the same thing, but failed to even see the comet much less get a photo. Millions of people around the globe saw the comet, but not me. Thousands of people on every continent photographed this visitor as it passed by, but I completely missed it. The problem, of course (aside from my bad eyes) is that while the heavens are busy proclaiming the glory of God, they do it silently and subtly. What I needed were icons, arrows, and flashing pop-up messages in the sky. If I had been wearing one of those Google Spectacle™ gizmos, I could have turned my head in the general direction of the comet Pan-STARRS and an animated Google Doodle™ would have directed me right to it. Oh brave new world. Because the heavens “speak” of God’s glory “without a sound or word,” their message is admittedly ambiguous. As David looked up at the night sky, especially on those long night watches in the fields as a shepherd, he had the time to really study what he was seeing, time to ponder what it all meant. He saw beauty. He would have observed the way the stars moved across the sky night after night, always returning to their places for the next night’s performance. He saw the faster-moving planets, the cyclical phases of the moon, streaking meteors, perhaps even a comet or two. When you take the time to look deep and long into the night sky, the universe seems almost alive, immense, ordered but sprinkled with random acts of unpredictability and surprise. In all that wondrous beauty and ordered chaos, David saw God at work. But what about today? Well, for one thing, half of us live in the midst of so much artificial light pollution that we never see the stars at all. And even when we might have a chance to look up, there are so many wondrous things dragging our gaze downward that we seldom do. I ate lunch yesterday at a Thai restaurant with some friends, and during the meal I noticed a table of four young men, all with their heads bowed. I smiled, assuming they were praying together. On closer inspection I could see that each of them was hunched over his smart phone, oblivious to the others sitting nearby, lost in the artificial wonders to be found in a tiny glowing screen. That may be an apt metaphor for our times: the heavens still declare the glory of God, but we’re all engrossed in our cell phones, too busy surfing and chatting and tweeting to look up. God is speaking. Are you listening? God’s glory is displayed in the heavens. When was the last time you paused to look up? 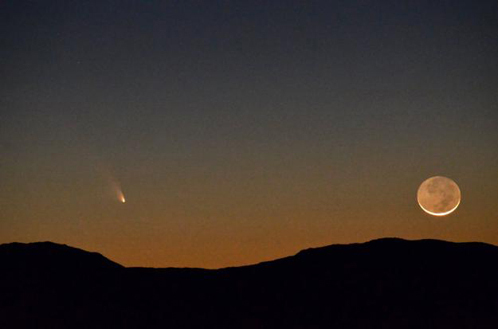 Photo credit: Parks Squyres, SaddleBrooke, AZ, March 12, 2013. I’m reading this, guiltily, looking downwards upon my mobile phone, Charlie. And when I look up I see the car roof, as I await my wife’s emergence from the supermarket. Man does not live by bread alone, but must, nevertheless make some provisions. Beyond my narrow horizon, grey clouds are parting just enough to belie their apparent screening out of the sun. There is little evidence of glory, as we normally think of it, certainly no comets or other heavenly bodies. And yet. I dare to believe, with you, that my horizon is a mere echo of that larger horizon of glory. Through this dimness I perceive something greater. And wait patiently for the clouds to part.